Summer Lodge is a spacious newly built very high specification property, located in the pretty Dorset village of Osmington less than a mile from the coast. It is truly luxurious with things most people only dream of having in their homes. The main one being an indoor heated swimming pool (perfect whatever the time of year), with patio doors opening onto a large patio and decked area, which is ideal for using in combination with the swimming pool when the sun is shining. You also have the benefit of a gym room housing a cross trainer and a running machine. If exercise is not your thing then why not make use of the games room, with its full size pool table, arcade style games machine and juke box, or just chill out in the adjacent lounge with its own cinema style flat screen TV. 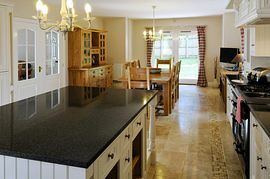 The huge kitchen-diner has solid granite work surfaces and attractive stone floors, with mosaic detailing and the formal lounge has a feature gas stove and another large flat screen TV. 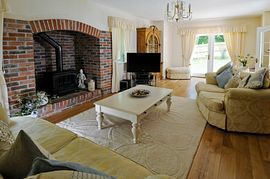 Internally the property is a joy with its well thought out décor, furniture and attention to detail throughout. 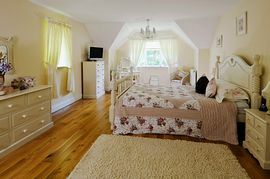 Three of the bedrooms are en-suite and the downstairs bedroom has an adjacent toilet, plus use of the separate shower room near the swimming pool, making this ideal for anyone who has difficulty climbing stairs. Venturing out from the cottage you will find the location perfect for walkers - pick from a gentle circular 2 mile walk which takes in the South West Coast path, to a more demanding 10 mile walk encompassing the famous while chalk horse etched on a hillside. The village of Osmington has a pub just a few minutes walk away, The Sunray, which has a comfortable restaurant serving an extensive menu, bar serving real ales and a large garden, with tables and childrens play equipment. Craigs Dairy just a few minutes walk down the lane, sells the milk from cow to fridge within a few hours, along with ice creams and local producer provisions such as ham and chutneys. A spar shop in Weymouth is just a few minutes car journey away. The nearest beach is a five minute drive away at Ringstead Bay, or five minutes further you may access the main long sandy resort beach at Weymouth, the nearest town, which has a good variety of restaurants, high streets shops and attractions. Summer Lodge is a real gem, which we are proud to have on the books and is sure to be a big hit with all who are lucky enough to stay there. Accommodation: Ground floor; formal dining hall. Large open plan kitchen-diner with patio doors opening onto a small patio area. Utility room. Formal lounge with patio doors onto a small patio area. Bedroom 1, double bed. Cloakroom with hand basin and toilet. Indoor salt water (far less salty than sea water) swimming pool, size: 3.6m x 8m. Patio doors opening onto a large patio and decked area with furniture. Shower room. Second cloakroom with hand basin and toilet. 1st Floor, via a staircase in the gym area; games room and 2nd lounge area with large flat screen TV. 1st floor via main staircase in the formal dining hall: Master bedroom (Bedroom 2), a spacious room with kingsize double bed, walk in wardrobe, en-suite with shower system incorporating two shower heads, body jets and radio, hand basin and toilet. Bedroom 3, twin single beds, en-suite shower with hand basin and toilet. Bedroom 4, kingsize double bed with en-suite shower, hand basin and toilet. Bedroom 5, twin single beds. Family bathroom, bath with rinse attachment, hand basin and toilet. The swimming pool and gym are to be used at your own risk as these areas are not supervised. Services in addition to standard equipment: Gas central heating. Coal effect gas fire in lounge. Fridge-freezer, washing machine, tumble dryer, dishwasher. Flat screen TV, DVD player in formal lounge and 2nd lounge, CD music system. Bed linen inclusive. Large surrounding garden with lawns, patio and decking areas and furniture, trampoline (again used at your own risk). Double garage plus off street parking for a further 4 cars. Linen Included in the price. Large surrounding Garden with lawns and with patio and decking. Trampoline but used at guests own risk. Local Services: Venturing out from the cottage you will find the location perfect for walkers - pick from a gentle circular 2 mile walk which takes in the South West Coast path to a more demanding 10 mile walk encompassing the famous while chalk horse etched on a hillside. The village of Osmington has a pub just a few minutes walk away, The Sunray, which has a comfortable restaurant serving an extensive menu, bar serving real ales and a large garden with tables and children's play equipment. Craig's Dairy just a few minutes walk down the lane sells the milk from cow to fridge within a few hours, along with ice creams and local producer provisions such as ham and chutneys. A spar shop in Weymouth is just a few minutes car journey away. The nearest beach is a five minute drive away at Ringstead Bay, or five minutes further you may access the main long sandy resort beach at Weymouth, the nearest town, which has a good variety of restaurants, high streets shops and attractions. Minimum of: £950 Maximum £2450. All bookings have an extra £18 added as a booking fee. 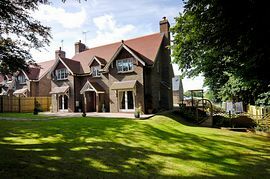 The owners of Summer Lodge require a £200 cash refundable damage deposit from Guests on their arrival at the property and this will be returned on departure, subject to a satisfactory check-out.